They say in the world of marketing that you need to really understand what the competition is doing to then allow you to determine how to beat them. Well, this theory also applies to SEO, and if you have never contemplated studying the competition, then you are putting yourself at a major disadvantage. Within this industry, this approach is known as competitive analysis, and getting to grips with what it means, and also how to then take advantage, is something that you are strongly advised to learn. Now, if you are at all concerned that this will be something that is only for those with a reasonable amount of experience within SEO, then you would be wrong. Instead, we will take you through not only a simple explanation of the process, but also the main areas you need to focus on to allow you to come to terms with what your competition is up to. Thanks to the information and steps that we will go through, you will find yourself in a position whereby you can reassess your online marketing approach to generate better results both in the ranking of your website, and also the volume of organic traffic that you receive. It is very easy for you to go online and come across a number of e-books and articles that are all focused on different aspects of SEO. However, less is available regarding competitive analysis even though it is a more central part of your entire approach than you may be aware. Chapter 1: The Basic Concept of Competitive Analysis. Let us begin by looking at the basic concept of competitive analysis and to clear up any confusion that may surround the term. By adopting this approach to your marketing plan, you should ultimately be able to learn more about the keywords and backlinks that your competition are using in conjunction with their own approach to marketing online. Now, it is impossible to learn every single thing about your competition in this way, but we will show you just how much information you can pull out that will then be useful to you and your own approach. Sadly, doing this in the correct manner is going to involve you spending some substantial time at the outset, but with the advantages that it can offer you, there’s no doubt that this will be time that is worth spending. So, what exactly is it that you are looking for? The aim is to spend time looking at the techniques and platforms that your competition is using to then understand their approach and adapt your own plan to counteract this. Look at it as being a form of marketing research whereby you can identify the areas that you need to focus on in order to better those that you are competing with. Once you have worked through the various steps that we will describe below, you will then be better placed when it comes to the keywords you should target, the number of backlinks you will need to rank, and even the way in which your content draws the visitors into your site. This approach is certainly something that is often overlooked, and yet there are a number of tools out there that can make life so much easier for you. After all, you should be prepared to spend time identifying as much information as possible to then allow you to produce that winning plan. To be honest, that is all that there is to it. If you were expecting more when talking about the overall basics of this approach, then sorry to disappoint you. On the other hand, it does mean that you are not going to require that specialist SEO knowledge that you may have been concerned about. However, just before we go into the actual mechanics of carrying out this research, we should talk a bit about the advantages that it is going to bring to your plan. Chapter 2: The Advantages it Offers. After the explanation in the previous chapter, it should become apparent as to where the advantages are for you and your own approach to SEO. Now, there are more advantages than you may be aware, so we will just look at some of the main ones. The first main advantage is that it provides you with an understand of what you are up against with your competition. You become more aware of what they are doing in their own SEO plans, and if they are clearly performing better than you; it could be argued that this form of imitation is the correct direction to head in. Identifying New Areas to Explore. This is yet another advantage that is worth checking out, especially when we are talking about keywords. With this approach, you are more likely to then be able to identify keywords that are largely being ignored. These niches can be valuable to you as a website, and you may never have identified them as you were wrong to think that only the main keywords or niches are worthy of checking them out. This is something that can help to boost your presence online in that you can get to grips with the backlinks that your competitors have, and also where they are getting them from. Remember, if they are performing better than you, then having this information at your disposal can then open up the door for you to improve the quality of your own backlinks, and benefit from it accordingly. Content is King. However, it can also prove to be rather useful from a marketing perspective if you can understand just how the competition is managing to pull in their visitors thanks to their content. As a result, you can then determine how best to adapt your own content to reflect their success. Remember, we are not even talking about making wholesale changes, but there is a certain sense of you being able to make often subtle changes that can make a huge difference. When moving up a single place can lead to a huge increase in visitor numbers, even small alterations can mean so much. We mentioned this earlier in the chapter, but as it is a key part of this entire process, we need to go back to it. What are they aiming for? How competitive are those niches? How does it then fit in with everything else resulting in them ranking above you? The importance of this should not be overlooked. In any industry there are a plethora of keywords and keyword combinations that may be potentially used. Of course, you will seek to identify your own niches to exploit, but being aware of what your competition is doing and the keywords that they focus on in their marketing does change the game. You Understand Their Site Structure. The fourth and final area that we can look at, and is an advantage to you, is by simply understanding their site structure. This can be seen as being vitally important as it means you will have a better understanding of the way in which their website is crawled by the search engine spiders, as well as knowing how they operate and get visitors to move between pages. This type of information can then result in you making effective changes to your website to allow you to improve your conversions percentage. As you can see, there are indeed various advantages of you taking the time to study your competitors. Of course, you need to be thorough with your investigations, and sadly most people will have no awareness of how to go about this. Thankfully, we have the answers and most important steps that you need to take. Chapter 3: How to Get Started with it. In this chapter, we are going to look at the ways in which you can get started with competitive analysis. It is easier than you initially think and requires relatively little knowledge or experience to then get a good understanding of what your competition is up to. Now, at this point we are going to use several tools to explain what is going on and in the next chapter, where you are walked through the approach, several of the same tools will be used. However, don’t think that you need to go out there and get all of these tools as that is certainly not the case. Instead, we will just be giving you an indication of the possibilities that are out there rather than anything else. The thing that we also have to do is split this up into several sections. That’s because there is keyword analysis as well as backlinks. Both involve their own approach, so we need to divide it to prevent there being any confusion between the two. Also, content is key, so we will include information regarding that in the next chapter as well. However, before we do that, there is one step that has to be first. Step 1: Identify Your Competition. Yes, the first step is indeed to identify your competition, and this may not be as easy as you would like to think. With this, you have to keep in mind that you are not only looking at those companies that offer the same products or services, but also those websites that are competing against you for certain keywords. It’s important to stress that both of those things need not line up perfectly with one another. For example, you may have a directory website or a local news website that is targeting keywords that you are aiming for with your website. We will cover this in the first step of our guide in the next chapter, but do not fall into the trap of believing that you know all of your competitors. Believe us when we say, you don’t. Step 2: Understand Your Keywords. What exactly are the keywords that you wish to target for your website? Are you even aware of what the best keywords or terms are going to be? Failure to grasp this concept from the outset is a major faux pas on your part. It means you can end up looking at the wrong competitors and going off down the completely wrong track right from the outset. Of course, you need to be aware of how to identify the keywords, so if you have not been able to learn about keyword research, then now is the best time to do so. In SEO, domain authority plays an important role. Google will rank websites higher that have a higher authority figure, so linking in with those websites can be beneficial to you. Get to grips with how your own website is viewed by Google by conducting your own research into your own domain before you go any further. This will provide you with a sense of the work that will then be required to get you to boost your ranking further. In the next chapter, we will discuss several tools that you may wish to use in order to make this process so much easier. They do not require any specialist knowledge, and at the same time they are very easy to use. They are not our own tools, but rather software and websites that are acknowledged in the industry as being among the best out there. Chapter 4: The Step by Step Guide. We just covered certain aspects regarding how to get started with this entire process of competitive analysis, but now we need to make things easier for you by providing a step by step guide. The idea here is to take you through the full analysis concept from beginning to end. By doing so, you will then have a better idea as to how to plan your own approach, and also the key steps you should follow to get the information you require. Step 1: Building Your Competition List. In order to conduct your competitive analysis, you need to start with creating your list of competitors as we discussed in the previous chapter. For this, we recommend several key approaches that just help you to ascertain who it is that you should be focusing on. First, do some keyword research. Work out the strongest keywords that you wish to target, and then conduct a survey whereby you check to see the names of the websites or companies that keep appearing when you are looking at your prospective keywords. To do this, you simply need to go to your favorite search engine, enter in the search terms, and then see which sites appear on the first page. Make a note of them, and then repeat the process with each and every keyword or keyword variation that you have lined up. By the end, you should have a better picture as to who is standing out, at least from the keywords point of view. Alternatively, you might want to use a tool known as SEMRush. This is a cool tool that is going to show you the list of competitors for your keywords, and it does away with all of the other stuff that Google can end up throwing at you. Using this tool is very straightforward, but to make things even easier for you, we will walk you through the main process that you should follow in order to get the kind of information you are seeking. First, you need to head over to semrush.com and sign up for an account. It takes just a few minutes, but it is going to be time well spent. After you have done this, you will be presented with this screen. As you can see, this is your dashboard, and next we can get to work on really getting to grips with the information it can provide to us. Now, you will see the box under the word ‘Dashboard,’ this is where you enter the information on the domain name that you wish to check and monitor. In this instance, we are going to use the domain name problogger.net. You will also see it says US, well you can choose the version of Google that it uses, so alter it to your own country and then hit add domain. When you do that, you get this screen, and as you can see there is a whole host of information on here for you to check out. It also lets you change between countries, and the data that it presents to you is as up to date as possible. However, we want to move the screen down a bit lower as that is where it gets interesting when you are checking out keywords for your research, and also understanding who your competitors are going to be. What you have on this screen is information on the keywords that they focus on and also their organic competitors. In other words, you can determine what they are targeting and also who they are competing against. From a marketing point of view, you can then ascertain who it is that you need to compete against, and also what they are doing from a keywords perspective, as well as the number of backlinks that they have towards their domain. As you can understand, this is extremely useful information to have at your disposal, but only if you know what to then do with it. The best part, is that you do have an option to export this information allowing you to sit and pour over it for an extended period of time. Considering how valuable this information can be, this is certainly something that is worth thinking about. In this instance, there are several things that need to be done in order to fully understand the information that you see before you. First, if you look at the organic competitors list, then those at the top will prove to be the sternest competition. You will see two different numbers. One is focused on search engine keyword numbers and the other are keywords related to that domain. The higher the number, then the stronger the competition. You can then click on the name of that competitor and check out more information on them to help you build your competitors list. However, look closely at this part, as the information here is important. What you have here is a graph showing how the different competitors sit when it comes to keywords and how that translates into organic search traffic. As you can see, tipsandtricks.com is way out on its own, but it doesn’t generate the highest level of organic search traffic. Instead, two domains that have a higher number of com keywords get more organic traffic. This shows the importance of getting the correct keywords for your domain name and then focusing on them as it is those that will primarily contribute to that increase in organic traffic. We can then go one step further. Over on the left hand side of the page, there is a section regarding keyword analytics, click on it, and you get this screen. This page opens up a whole host of possibilities when it comes to the keywords that you should be targeting. It can be used to identify where your competition is coming up short, or performing strongly, and also why they are doing so well. This kind of information can then be put to good use by your own self as a means to really get to grips with your keyword campaign, and also whether or not the company in question is indeed a competitor. But there is more to just discovering the competition in this way. You also need to understand their backlinks, which is what we will look at next. Once you have spent time studying the keywords situation, you then have to consider moving onto another important area of SEO, which is backlinks. Now, if you thought that this would be something that is hidden away, then you would be wrong. Instead, there are ways and means to study the links that are connected to a website, so you are then able to ascertain if you are missing out on popular links, and also how to then beat the competition. With this, there should be four key areas for you to focus on. 1. The number of links that your competition has. 2. Where they are generally getting their links from. 3. Which pages do those links tend to point towards? 4. How are they making use of their anchor text? All four of these questions should then make it easier for you to alter your own links campaign resulting in better performance, and an ability to potentially rank higher on the search engines. Now, in order to go ahead and actually uncover all of this information, we need to look at using some software that can help us out. In this instance, we recommend using ahrefs.com and indeed that is what we are going to use in this particular example. Of course, we will stick with the problogger.net example that we used with the previous step. So, go to ahrefs.com and sign up for an account. Once again, it takes just minutes to do, and then you are ready to start work. You will then see a screen that looks like this. As you see, your dashboard is empty, so let’s add in problogger.net in the box at the middle of the screen and see what happens. On this screen, it allows you to set up a project. This makes it easier for you to keep track when you are studying a number of different competitors, so just basically leave things as they are and then click on that Next button. You are then shown this at the top of the screen. This screen is pretty self-explanatory, but you do need to understand the keywords that you will be focusing on. You add the different keywords in the first box using a comma to separate them. You can then hit next when you are ready, but first let’s look at the lower half of the screen. This list in itself is useful. It shows you the keywords you are ranking for and also the position you have for them. It lets you know the areas you have to work on. However, once you enter your keywords, you are then shown this page. As you can see, this is where you get to grips with your competitors. There will be some on there that you just cannot compete with, unless you have a huge budget. At the same time, it does provide you with links to then go and explore to get to grips with what they are doing as part of their strategy. Alternatively, you an enter in the domain name of a competitor to the right hand side and then click on next. In this instance, we are going to add hubspot.com. At this point, you can include related keywords or competitor brands that you wish to track. You can add as many as you like, and then click on finish. At this point, you are then shown the number of backlinks that it has as well as the number of referring domains. Next, you want to click on the backlinks section, so in this instance you click on the number 922k. When you do this, you are then presented with information on the different backlinks including the domain rating, url rating, social links, and also the anchor text. The anchor text in particular is important as it allows you to see the kind of keywords that are being used in this instance. Furthermore, you can then study the different links by moving to the left hand side of the page and check out those that are new, lost, or broken so you stop making the same mistakes. 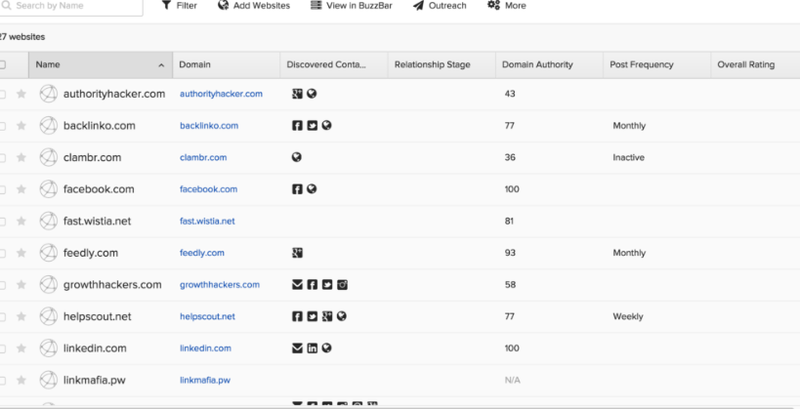 Also, you will be able to check out competing domains and pages to give you an indication of who is doing what with their backlinks. As you can imagine, this is powerful information, but then it is still up to you to determine the best way to put all of this into action. Step 3: On-Page SEO Strategies. The third step that we will look at is more to do with checking out the strategies that they are using when it comes to their on-page SEO. The idea with this step is that you can determine what it is that they are doing differently to you, and to then take some of those concepts and apply it to your own pages. Now, some people may feel that this is copying them but let’s be honest, you need to be willing to do anything you can, within the laws, to get yourself ahead of the competition. Also, they may have already done it to you as well, and this practice is widespread as well. How they are using their title tags. Understanding their meta description and comparing to your own. The way in which they are using H1 and H2 headers on their page. How they use keywords in their content. Understand just how relevant that content is in relation to the keywords contained within it. As you can see, we are not even talking about too many different aspects for you to get to grips with. This process is so much easier than most people are aware. However, it is understandable that you may not have the industry know-how to help, but that is where technology and software comes into its own. 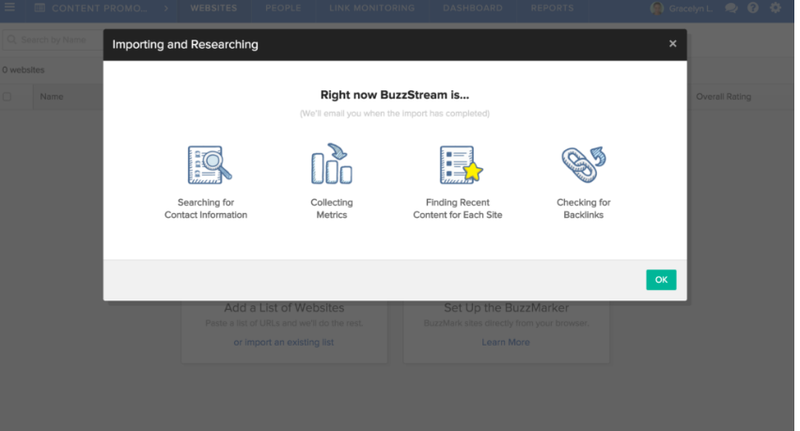 In this instance, as we are talking about effectively studying content, then we can recommend using Buzzstream to help you to better understand. Head on over to buzzstream.com and sign up for an account to start things off. After you do so, you will then be shown this particular screen. As is the norm, we are going to use the problogger website as our example, so you need to add that in to allow Buzzstream to get to work. You then have to just wait to allow the site to do its job as it heads off and conducts research into the website that you have added. Remember, you can do this with a number of different websites at the one time, so that is why we have added this in last when it comes to your research simply because this is used at the point where you are aware of who is most likely to be your competition. Now, the main reason for using Buzzstream is because of the way in which it can help you to build links and also promote your website via your content. Remember, content is going to be key for your future success online especially with the way in which Google is stressing that it will continue to play a central role in online marketing and SEO. But here’s the thing, and this is where it gets clever. We are going to look at using Buzzstream in a slightly different way. What you need to do is to research a list of potential bloggers or websites that are within your niche. Save their URL’s in a spreadsheet and then import them into Buzzstream, follow the steps above and then give it some time to work its magic. What it is doing at this point is it trawls the list of websites you added for not only the contact information, but also how busy it is, what kind of content it has recently added, and the number of backlinks which gives you an indication of its authority. All of this can then be put to good use and if we say that we added a list of blogs and it has done its searching, then it can result in you seeing a page that looks like this. This then shows you the key blogs and websites for you to focus on within your niche. You can then organize things according to those individual columns, so if you wanted to only look at the websites that had the highest domain authority, then you simply click on that column to sort it in order, and Buzzstream will do it for you. The key here is that you will be able to work out the best sites to target for your content, and that does make a huge difference to the potential success of your website. Also, you can seek inspiration from the websites and this will help you to determine the way in which your own website should proceed with the content. Chapter 5: The Key Mistakes to Avoid Making. Finally, we need to look at the key mistakes that you really must avoid making when you are carrying out this kind of research. If you can just keep in mind that the work you do here has a direct impact on your entire SEO plan, so any mistake at this point could have potentially long-term consequences. We have shown the way in which you need to conduct the analysis in the first place, but at the same time you do need to be aware of mistakes that can give you a false understanding of what is actually going on. Clearly, this should be avoided, which is why we strongly recommend that you take your time while conducting this research. 1. Focusing on the Wrong People. Yes, it is possible for you to spend time studying the wrong people. Just because they show up under certain keywords does not necessarily mean that they are in direct competition to you. It is best to correctly identify the competition as your first step to prevent this from becoming an issue. Make sure that you don’t focus on the wrong areas. 2. Believing You Already Know Everything. Complacency is a horrible thing. It is even worse when it has a detrimental impact on the potential success of your website. Only checking one or two of your competitors is a cardinal sin simply because the more you check, the better the picture you will get. As a result, you can have a distorted point of view when you only check one or two websites or links. This can then lead to you creating the wrong campaign with you then wondering why you are unable to make the progress that you had previously anticipated. 3. Doing the Wrong Research. This is slightly different to the first error as we are talking about conducting the wrong research on keywords to start things off. In all honesty, you should look at understanding how to do your own keyword research before you go any further. You must be aware of what you need to focus on before you then start to look at your competition. It is all too easy for you to set off down the wrong road. Those are the three main areas of concern that could spell disaster for your attempts to study and understand your competition. However, if you do indeed follow the steps that we have noted above, then you should have no issues whatsoever. In fact, the main issue will more than likely be having too much information to then interpret. If you are at all serious about making some significant progress with your online marketing exploits, then competitive analysis should form an integral part of your plan. Without it, you have no real idea what you are up against with your competitors, and they may very well have the upper hand over you. Doing anything that can turn it in your favor is something that you really must be prepared to do. Without it, you are just fighting in the dark which may very well lead to you spending considerably more money and getting less results in the process. Make your life as easy as possible by using the programs that we have mentioned above. They do help you to get to grips with your competition and assist you in putting a plan into action. When you consider that future conversion rates and even general organic traffic is going to be affected, then it would be crazy of you to not take them into consideration and then put them into practice. Competitive analysis is not just something that you should think to maybe do, it has to be something that you do if you are serious about making any headway when it comes to marketing and your website. You want to stand out from the rest, and the best way to achieve this is by not only copying what the rest are doing, but to then surpass it. That is what competitive analysis does, it makes life easier for you to know what others are doing and to then plan out how to beat them.